Cotswold Canals Trust Volunteers are on an archaeological 'dig'… but without the aid of TV’s Time Team and their ‘geophysics technology’ that reveals subterranean hidden mysteries. Mike Langford, Derek Jefferies, Richard Hicks, Steve Broadbridge and Thomas Bonnie are pictured on the lock-side outside the Visitor Centre at Wallbridge Upper Lock. The team had been tasked with finding an 'inspection hole’ to give a clear view of the cause of a suspected blockage of the lock by-wash or spill-weir. Their close and delicate scrutiny revealed just that! A rectangular access roughly 6 inches by 4 inches was found tightly sealed with a stone block. When removed it allowed a view of the underground culvert that carries excess water past the lock. Work continues and a camera and lights will soon be lowered into the dark, damp space. 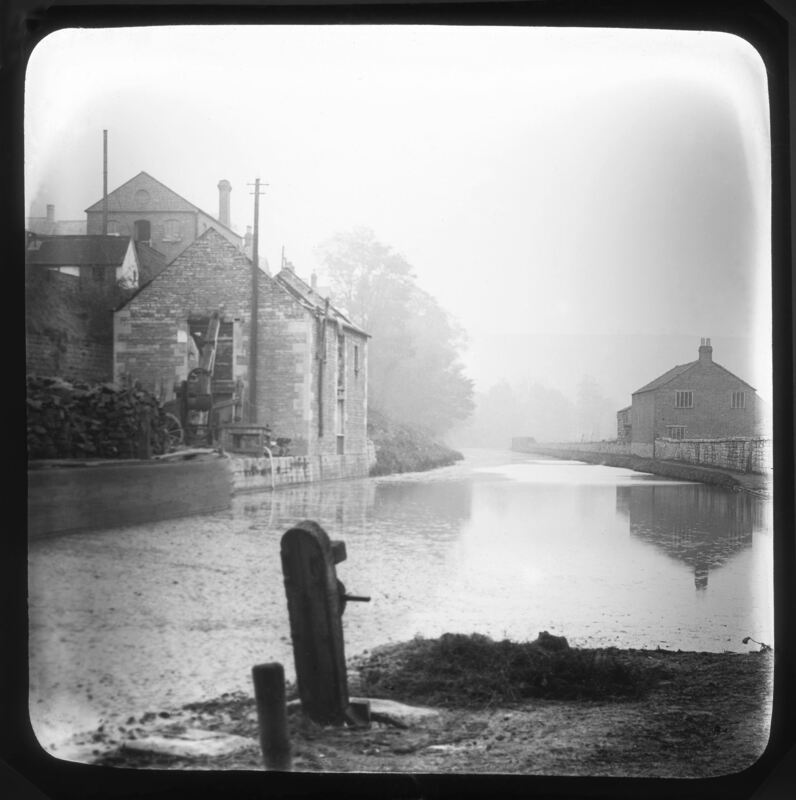 In the meantime… there is a call for any historic photographs of Wallbridge Upper Lock that might provide evidence of the original underground infrastructure. Such historic photographs do exist. Here is one such, possibly dating from the late 1800s. It shows the view looking east with a narrowboat berthed at Cheapside Wharf; its recently delivered a load of coal lies neatly stacked on the wharf. The image, on what is believed to be a glass magic lantern slide, was recently donated to the visitor centre by a person who was in such a rush that he was able to leave only his Irish email address. We sent an email of thanks and a request for details of the provenance of the glass slide bearing this atmospheric image. To date we have not had a reply. Click on the Wallbridge image to view a larger version. If you read this and are that generous benefactor please drop an email to mail@cotswoldcanals.com Our own 'Time Team' would like to chat!